This page shows results found in the literature for anomalous event detection in crowd data sets. If you like to have your published results added in the following tables, please send an e-mail to Rensso Mora with the link (or the pdf) to your paper and the results to be reported. Up to now, we have tabulated the results for the following datasets. Rensso Victor Hugo Mora Colque, Carlos Caetano, William Robson Schwartz, “Histograms of Optical Flow Orientation and Magnitude to Detect Anomalous Events in Videos,” in SIBGRAPI, 2015. W. Li, V. Mahadevan, N. Vasconcelos, “Anomaly detection and localization in crowded scenes,” in IEEE Transactions on, 2014. J. Kim, K. Grauman , “Observe locally, infer globally: A spacetime mrf for detecting abnormal activities with incremental updates,” in CVPR, 2009. R. Mehran, A. Oyama, M. Shah, “Abnormal crowd behavior detection using social force model,” in CVPR, 2009. Kai-Wen Cheng, Yie-Tarng Chen, Wen-Hsien Fang “Video Anomaly Detection and Localization Using Hierarchical Feature Representation and Gaussian Process Regression,” in CVPR, 2015. Y. Yuan and J. Fang and Q. Wang “Online Anomaly Detection in Crowd Scenes via Structure Analysis,” in IEEE Transactions On Cybernetics, 2015. V. Saligrama, Z. Chen “Video anomaly detection based on local statistical aggregates,” in CVPR, 2012. Xu, D., Ricci, E., Yan, Y., Song, J., Sebe, N., Kessler, F.B. “Learning deep representations of appearance and motion for anomalous event detection ,” in BMVC, 2015. Zhou, S., Shen, W., Zeng, D., Fang, M., Wei, Y., & Zhang, Z. “Spatial-temporal convolutional neural networks for anomaly detection and localization in crowded scenes ,” in Signal Processing: Image Communication, 2016. Zhang, Y., Lu, H., Zhang, L., Ruan, X., & Sakai, S.“Video anomaly detection based on locality sensitive hashing filters,” in Pattern Recognition, 2015. Lu, C., Shi, J., & Jia, J. “Abnormal Event Detection at 150 FPS in MATLAB,” in International Conference on Computer Vision, 2013. Zhang, Y., Qin, L., Ji, R., Yao, H., & Huang, Q. “Social Attribute-Aware Force Model: Exploiting Richness of Interaction for Abnormal Crowd Detection,” in IEEE Transactions on Circuits and Systems for Video Technology, 2015. Cheng, K., Chen, Y., & Fang, W. “ Gaussian Process Regression-Based Video Anomaly Detection and Localization With Hierarchical Feature Representation,” in IEEE Transactions on Image Processing, 2015. Liu, Y., Li, Y., & Ji, X. “ Abnormal Event Detection in Nature Settings,” in International Journal of Signal Processing, Image Processing and Pattern Recognition, 2014. Hu, Y., Zhang, Y., & Davis, L. S. “ Unsupervised abnormal crowd activity detection using semiparametric scan statistic,” in IEEE Computer Society Conference on Computer Vision and Pattern Recognition Workshops, 2013. Antić, B., & Ommer, B. 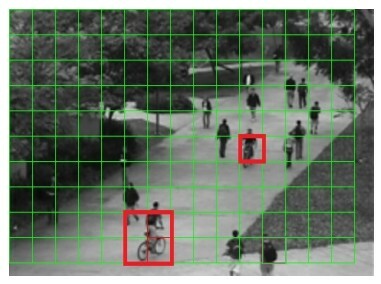 “ Video parsing for abnormality detection,” in Proceedings of the IEEE International Conference on Computer Vision, 2011. Nallaivarothayan, H., Ryan, D., Denman, S., Sridharan, S., & Fookes, C. “ Anomalous Event Detection Using a Semi-Two Dimensional Hidden Markov Model ,” in In Digital Image Computing Techniques and Applications (DICTA), 2012. Xiao, T., Zhang, C., & Zha, H. “Learning to detect anomalies in surveillance video ,” in IEEE Signal Processing Letters, 2015. Mehran, R., Oyama, A., & Shah, M. “ Abnormal crowd behavior detection using social force model,” in IEEE Computer Society Conference on Computer Vision and Pattern Recognition Workshops, 2009. Du, D., Qi, H., Huang, Q., Zeng, W., & Zhang, C. “ Abnormal event detection in crowded scenes based on Structural Multi-scale Motion Interrelated Patterns,” in Proceedings – IEEE International Conference on Multimedia and Expo, 2013. Lee, D. G., Suk, H. Il, & Lee, S. W. “ Crowd behavior representation using motion influence matrix for anomaly detection,” in 2nd IAPR Asian Conference on Pattern Recognition, 2013. Yuan, Y., Fang, J., & Wang, Q. “Online anomaly detection in crowd scenes via structure analysis ,” in IEEE Transactions on Cybernetics, 2015. Zhang, Y., Qin, L., Ji, R., Yao, H., & Huang, Q. “Social Attribute-Aware Force Model: Exploiting Richness of Interaction for Abnormal Crowd Detection.,” in IEEE Transactions on Circuits and Systems for Video Technology, 2015. (*) Some results are presented for entrance and exit sequences respectively.